How much does it cost to travel to Hobart? How much money will you need in Hobart? AU$151 ($108) is the average daily price for traveling in Hobart. The average price of food for one day is AU$25 ($18). The average price of a hotel for a couple is AU$190 ($136). Additional pricing is in the table below. These average travel prices have been collected from other travelers to help you plan your own travel budget. Hobart is the capital city of the Australian island state of Tasmania. It is small compared to the mainland's larger cities and has a cooler climate with four distinct seasons. Hobart is also the second oldest capital, behind Sydney, with remnants of its past visible in old sandstone warehouses now home to cafes and galleries, as well as a historic district with narrow lanes and colonial-era cottages. Hobart is a hub for museums and art galleries, the Tasmanian Museum and Art Gallery existing as the center of it all with a range of permanent exhibitions, including displays on Australia's Aboriginal and colonial history, an extensive coin collection, as well a great exhibition on Tasmania's relationship with Antarctica. The Maritime Museum of Tasmania is also worth a visit, as is the Museum of Old and New Art (MONA) which features traveling exhibitions from international artists. A number of smaller galleries are located in the district of Salamanca Place, some of which include the Despard Gallery, Salamanca Arts Centre, Handmark Gallery, and the Colville Street Art Gallery. The Royal Tasmanian Botanical Gardens is a sight that brings visitors a little closer to nature. Established in 1818, these historic gardens cover almost 35 acres with its most unique attraction being a Subantarctic Plant House. The climate-controlled environment is home to plant and animal species that thrive in the wet, cold conditions of subantarctic islands. Other nearby attractions include Port Arthur on the wild Tasman Peninsula, Mount Wellington just behind the city, wine country, whiskey distilleries, and a number of offshore islands. Salamanca Place is Hobart's hub for shopping and dining. The district features a terrace of warehouses dating back to the whaling days of the 1830s, now home to trendy galleries and cafés. Salamanca Market, a major Saturday morning attraction, also takes up some of the warehouse space in a maze of craftsmen's workshops, gift shops, restaurants, and more. These market stalls are some of the cheapest places to pick up authentic souvenirs. Nearby, just behind the Salamanca Market, is Battery Point. This is Hobart's historic district with much to offer in architecture and sights with beautiful sandstone mansions, colonial cottages, and impressive river views. All this sits at the foot of Mount Wellington, Hobart's natural backdrop. Beyond shopping, dining, and gallery-going, Hobart provides easy access to a number of outdoor activities. 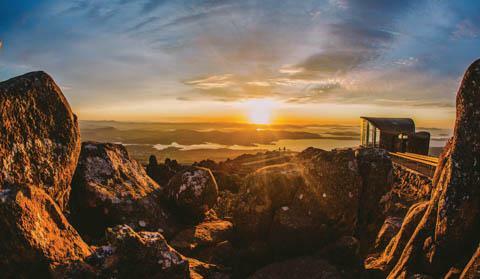 From the base of Mount Wellington, visitors have the option to take a short walk, long hike, or mountain bike up to its rocky summit for views overlooking the city and valley below, especially beautiful at sunset. Then, on the water side of things, Tasmania's scenic coastline is a great place to kayak or cruise amidst more than 300 offshore islands. You might spot sea caves, rock formations, and even wildlife like seals, dolphins, and whales. Tasmania is also a center for whiskey distilleries and wineries for those looking to indulge in the sampling scene. It is home to the award winning Sullivan's Cove Whisky, as well as Tasmania's finest whisky distilleries, Nant Whisky Cellar and Lark Cellar Door. Richmond, just 30 minutes away, is a gateway to some of Tasmania's finest wine-growing areas. For a nice day trip, Bruny Island is about 45 minutes from Hobart's city center, via a car ferry from Kettering. Here, there is plenty to indulge in from ice cream and whiskey to local wine, cheese, and oysters. Some highlights of the island include an abundance of wildlife, a cheese factory, and a number of museums. Pennicott Wilderness Journeys also organizes cruises along the stunning coast of South Bruny National Park. With its location on the water, fresh fish and seafood are a specialty of the region with an abundance of excellent seafood restaurants. Deep sea trevalla is unique to Tasmania, while Tasmanian lobster is also popular. Scallop pie is another Tasmanian favorite, a kind of savory pastry easily found at the Salamanca Market food stalls. Other seafood specialties include crayfish, orange roughy, salmon, and oysters, both farmed and wild. Beyond seafood, there are many vineyards scattered across the island, and local beer brands like Boags and Cascade. Most restaurants are concentrated in the Salamanca and North Hobart areas. By plane, Hobart city center is 15 kilometers from Hobart International Airport, in Cambridge. There is a shuttle bus from the airport to Hobart, but reservations are recommended. By boat, cruise ships usually dock at Macquarie Wharf, which is on the eastern side of the docks on Hunter Street. The Spirit of Tasmania runs up to two sailings per day between Melbourne and Devonport.